Part 1 of my blog on power dimensions and danger zones was well received. I noticed some unusually high views from territories that usually rank (very) low in my list of viewers (eg, Russia). A friend recommended narrowing this subject down to Europe (EU). 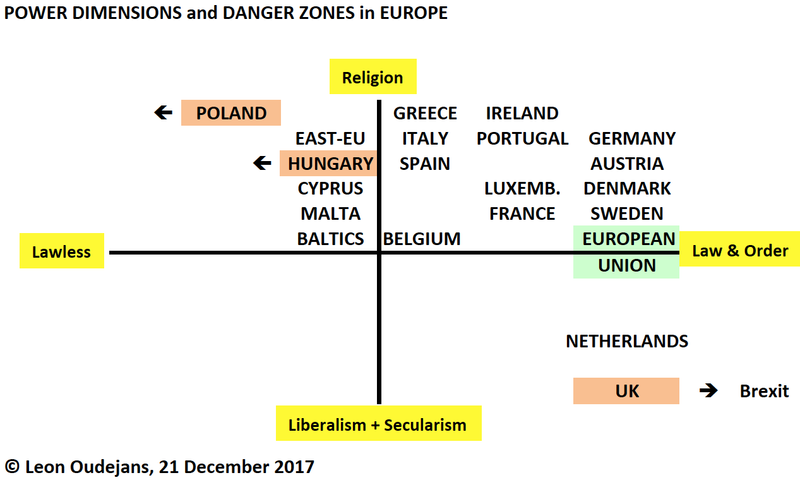 This new diagram exposes the danger zones within Project Europe, my 15 November blog. The plotting of EU countries on both axes is mostly based on my gut feeling. In some cases, I used Wikipedia for verification (eg, Cyprus, Estonia, Latvia, Lithuania, Malta). The upper-left corner includes the countries following the 2004, 2007 and 2013 eastbound EU expansion. The upper-right corner includes all European nations that entered the EU after 1951 and before 2004. Similar to my international version, the danger zone is in the upper-left corner: authoritarianism and religious extremism behind a facade of democracy. Hungary and Poland are both shifting to the left. Time will tell in which direction the other new EU nations will evolve. On 20 December 2017, the EU took a drastic step to counter Poland's direction. This step is usually referred to as the "nuclear option" as it may - ultimately - strip a country of its EU voting rights (eg, EurActiv, Guardian, Politico). The lower-right corner may be a second danger zone. The Netherlands has often supported the UK within the EU, and has lost a close ally following Brexit. 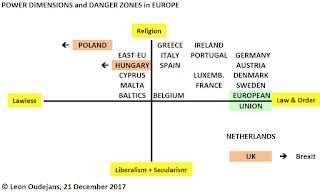 Rather than "No Religion", the y-axis now has a new label at the bottom: Liberalism (my blogs) and Secularism. Both appear to have a high correlation. Both also trigger another thought: a lack of solidarity. The philosophical belief in the concepts of Liberalism (ie, freedom) and Secularism (eg, atheism) may explain why some nations believe that independence (ie, freedom) benefits can exceed a union's solidarity benefits. In the Netherlands similar political parties have N-exit dreams.